But where is it? When was the photo taken ? Any other information you can give about the engine and surroundings ? The engine number looks like a clear 1434, but that number was occupied by the Problem 'Eunomia'. What looks like a '3' on the numberplate has a rounded top instead of the standard flat top, so is presumably a '2', with some mark on the photograph to obscure its bottom left end, so probably it is actually 1424. This engine was built in May 1865, converted to a Special DX in May 1890, renumbered as duplicate 3106 in August 1910 and scrapped in May 1911. When new, the 14xx DX engines were allocated to Liverpool, and I'd guess the photo was taken thereabouts, maybe at Edge Hill, in the early 1890s. Perhaps some demolition is taking place off to the left, leaving a house chimney-pot posed in the foreground. I have nothing definite to add to the solution only observations. A cleaned up image shows the DX is No.1494 which doesn’t change Harry’s observations on the possible location. I've looked at Liverpool and Birkenhead large scale maps and can not reconcile the sheds and the houses (1909). The second road from the bottom looks like the old 75lb rail with the wide sleeper spacings and on the forth road a few Stephenson type chairs? The loco footplate appears to be stacked with stores. I really want the carriage to be the 5 compartment parcel van, but I think the end panel is wrong and I can not make out the wording on the door. The roof structure most definitely bear comparison with the roofs (upper right) in plate 42 of Ted’s book on Crewe works. Again: I can not reconcile the number of sheds and the house positions on my 1908 map, but, the area around Bessemer St. (old signal shop?) looks promising, alas now a mere smudge on Google Earth. A fly in the ointment might be the GWR finial on the telegraph pole above the loco chimney and I have no map for the Gresty Rd area. I am sure Philip will tell us, but I think that carriage is far more interesting than a 5-door parcels van. I think its a 4-door parcels van. To confirm that the DX is engine No. 1494 - and there are some odd things on the footplate, which I have been unable to identify. 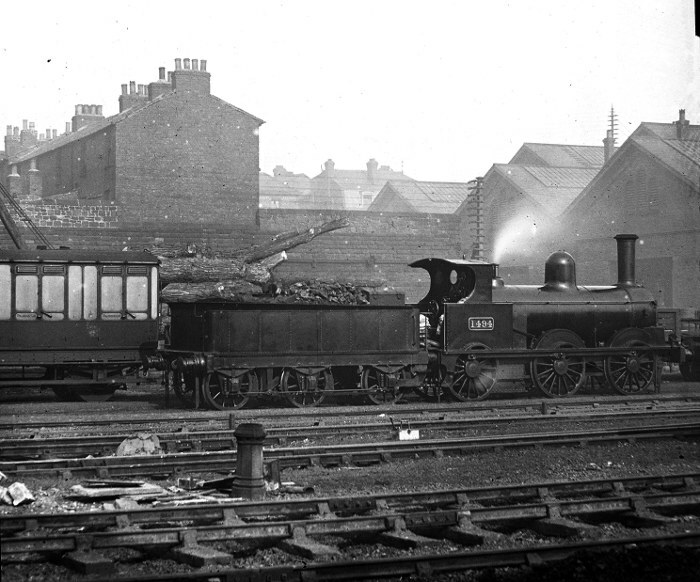 The engine is however in steam as the safety valve is ‘feathering’, a headlamp is on the front right buffer plank socket, the tender is full of coal, and so the assumption could be made that the engine is ready to work a train, which, if so, may indicate that the location is more likely to be a ‘shed’ rather than a ‘works’. The shed label on the back of the cab roof is not decipherable, The inset panels on the coach appear to be lettered ‘Parcels’. Behind the tender and the coach are tree trunks and I’ve no idea as to their significance. Does this help anyone? The locomotive depicted has no vacuum brake connection on the tender, nor any form of brake on the engine. As No 1494 was rebuilt 6/88, surely by this date automatic brakes would have been fitted as part of the rebuild - I recognise that early rebuilds were not so fitted but do not think that 6/88 was “early” in this context. It is difficult to see if the smokebox front is sloping, because the vertical sand gear rod and its top bracket are in the way, but these look as if they may be close to the frontplate - the rebuilds of this period had a distinct gap between the bracket and front plate, not evident here. The coupling rods have the earlier split brasses in square ends, though early rebuilds retained this feature until the 20th century. The tender has no coal rails, so before 1895/6. I think we are looking at an unrebuilt DX, with very well polished paintwork, and the estimated date of the picture has to be put back to before,say 1887. Behind the tender and the coach are tree trunks and I’ve no idea as to their significance. Does this help anyone? Thanks, Gary; so it is actually No 1494! This one was built in 4/1866, converted to SDX in 6/1888, duplicate 3177 in 1/1912, and scrapped 10/1919. There was a large goods shed with rail access from the east, opposite Edge Hill station platform on the north side, and the tracks from the Waterloo tunnel and Riverside station passed in front. A photo at Edge Hill on pp32/3 of Colin Reed's book shows several house-ends similar to the one shown behind 1494; presumably these were west of the goods shed. An old OS 25" plan - or someone with local knowledge - could settle this, one way or the other. Mike is quite right — it is a 25ft 0in x 7ft 9in four-wheeled Parcels Van, of which around 40 were built from 1869-1877, supplemented 1888-1890 and withdrawn between 1901 and 1904. The number is very indistinct but if it is 1 or 2 digits then the date of the photo is before the vehicle was supplemented (2xxx series), that is before around 1890. A single digit is very plausible — they were numbered inter alia 1, 2, 3, 4, 5, 7 and 8, with 47 as the highest number. I think Jim Lodge’s estimate of c.1887/8 is very likely correct. With reference to www.old-maps.co.uk and the 1:500 Town Plan of 1891, this does appear to fit well with Edge Hill Goods Station. The row of houses on the left would be on Speke Street and the crane seen behind the parcel van corresponds with that shown on the loading dock situated between the Waterloo Branch and the line leading to the Fruit & Vegetable Depot. The building in the centre background would therefore be the Botanic House pub on the corner of Wavertree Road and Botanic Road. Not much remains to place this scene now, sadly. If you look at the bench marks around Speke st. and indeed for a thousand feet out , there is only about ten feet of elevation variation; the area to all intents and purposes is flat. The photo shows two distinct ranges of sheds with the rear group at a higher elevation. On the 1908 25" the nearest sheds do not exist. The window style and roof profile of the Botanic do not match a photograph taken before demolition. I still find it difficult to comfortably reconcile the photo with the OS maps and for that matter Google Earth even if I accept the amount of excavating to achieve the current levels. Post #18, looking west, shows the Goods Station on the far right with a step in the roof height — which could be interpreted as a separate building in the mystery photograph, as per Gary’s comments — and Speke Street beyond. Post #19 shows the front elevation, which appears to match the rear elevation of the mystery photo, architecturally. The triple-gabled, stepped roof form is also just about visible in post #21, towards the top left. Hope that helps! I might have identified the items on the footplate: You Tube video at 5.09 there is a shot of drawabar washers which have a good passing resemblance. The Crewe DO lists show that 1494 was indeed fitted with AVB complete at the time of conversion in June 1888 — as indeed were (almost) all conversions from Aug 1887 onwards. [LNWRS Archive LOCO 009/1]. My article “fish” Part 2c (in the current Journal) has a little more background on this.